Hands-on reprint of the famous publication from Mother Earth News. This book is actually larger and easier to read than the original paperback copy of the book. It covers wood heat and wood power, water/hydroelectric home power and RAM-pumps. 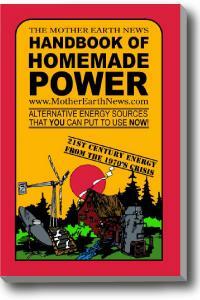 The handbook also has chapters on wind power, solar energy and an extensive chapter on making and using methane. Unlike most of the books, articles and TV reports on developing energy issues, this manual will NOT bore you with dyer projections of out of control gasoline consumption or unprecedented electricity shortages. Nor will it question the virtues of geothermal power versus nuclear fission versus the "hydrogen economy" as solutions, to our society's increasingly unsatisfied appetite for energy. Instead, this handbook is designed to help you sidestep the energy problem once and for all—on a very personal basis—right here and right now. In the pages of this guide, you'll learn how to heat and cook with that most traditional of all renewable fuels, wood. You'll find working plans for the construction of two kinds of water wheels and the dams and other hardware that go with them. You'll discover how to find and rebuild an old wind-driven electrical generator, build your own from scratch or—if you aren't that handy—buy a brand-new unit and have it installed. This manual shows you how to construct a solar stove, oven and water heater. It explains—in simple, uncomplicated lan­guage—just how Steve and Holly Baer heated their New Mexico home with ninety 55-gallon drums and the sun. It takes you step by step through the production of a usable fuel—meth­ane—from waste . . . in both test quantities and batches large enough to heat your house and power your automobile. The following pages, in other words, are packed with infor­mation about "alternative" energy systems that really work and that you can put to work right now . . . today! Yes, there are answers to the developing energy crisis . . . and you can hold a rich collection of those answers in your hand if you order this handbook! When you can, begin felling a tree by first removing some of its branches. Do this with a first-cut into the limb from the bottom with your chain saw. Then sever it from the top. Your initial cut into the trunk itself should be horizontal, about one-third of the way through the diameter (see Fig. 1), and into the side toward which you want the tree to fall. Next saw diagonally downward to the deepest point of the first saw mark. When you make your third and final cut (from the opposite side) don't saw all the way through the trunk. Leave enough wood to serve as a hinge, which you can sever after the tree falls (see Fig. 2). Otherwise, when the great mass crashes to the ground, the branches will act as springs and cause the trunk to kick back. Begin trimming out your fallen tree by cutting away the small crinkly branches. Thick chunks are a little more difficult ... and here's how I break up hard white oak: First, I examine the face of the wood for any existing cracks (which serve as my splitting guide). Then, with a six-pound maul, I start swinging away at the center of the drum (see Fig. 3). Sometimes the piece splits open quickly. Other times, not. It's satisfying but tiring work. In the case of our infamous first adventure, we tried to lower a tower and generator with a line tied to the back of my pickup truck while two men "steadied" the assembly by holding lines perpendicular to the lowering line. Fig. 4 was made from a photograph which was taken only an instant before the rig got out of control and crashed into the ground . . . bending the tower, breaking the cast-iron generator housing and gear box in several places and plowing a big hole in the soil. It was a lesson that could have been tragic . . . anyone struck by the falling tower would have been killed instantly. Alright, Let's see what your solar-heated homestead house might look like (see Fig. 4): As small as practical, it should probably be based on the MIT Type A design with a roof collector oriented to the south at the angle of latitude plus 15 degrees. The structure would have large south-facing windows with interior shutters; no windows or doors on the west (to shield against the coldest winds); entrance on the eastern (most sheltered) end; and relatively small, well-sealed windows on the north. You might also try a reflector at the base of the collector. It would, of course, increase the collector's efficiency and—on the "A" design—shield the large windows during summer heat.